Sly 3: Honor Among Thieves continues the popular stealth/platforming series with a few new twists adding to the already solid gameplay mechanics players have come to love. The biggest addition this time around is split-screen multiplayer battles, where two players compete head to head to complete a mission while trying to sabotage their rival. Sly 3's single player mode remains as solid as ever with the same tight play mechanics, ingenious level design and, fluid controls you've come to expect. However, Sucker Punch has added several cool 3D areas which add another cool dimension to the proceedings. Read our review and find out why the stealthy Sly 3 remains virtually untouchable. Even though Sony's other mascot titles like Jak & Daxter and Ratchet & Clank have received more attention from gamers, the Sucker Punch developed Sly Cooper series has quietly built a large following amongst gamers. This is largely thanks to its unique cel-shaded design and brilliant gameplay mechanics which mix traditional platforming action with stealth spy moves to create some of the most memorable platforming titles on the PS2. A cast of memorable characters and interesting plots add to the game's appeal. The first thing you should know about Sly 3 is that it maintains the slick, sophisticated level design of the previous games. Sly titles have always been intelligent platform title that succeeded among a broad audience. In Honor Among Thieves, players once again set their sights on capturing a hidden fortune. This time however, it's the Cooper family's hidden treasure itself which has been buried inside the old gang's long forgotten hideout. The Cooper gang's latest adventure takes them throughout the world in a variety of locations ranging from deserted islands to the streets of Venice. Along the way, they encounter a number of old friends and adversaries plus some brand new characters. This continuity with the previous games gives Sly 3 an instant familiarity that should please those who've followed the series since its inception. Sly 3 picks up directly after the events of the last game. Following the final epic battle with Clockwerk, the gang finds themselves in a state of disarray. Sly continues his professional hacking ways, but his two partners in crime are in a bad state. Bentley has been confined to a wheelchair and is seemingly out of commission while Murray finds himself wracked by guilt and is living a life of solitude with a spiritual guide. After an initially unsuccessful attempt to find his family fortune, Sly goes to meet with one of his old family friends to seek out more help, and also to try and reassemble his team. 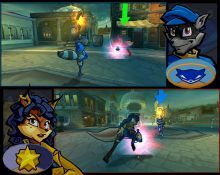 Like the first two games in the series, Sly also finds himself chased and followed by Inspector Camelita Fox, who pursues him throughout the world, shadowing his movements in an attempt to capture her rival permanently. The new game's plot will take players on a variety of missions throughout a variety of interesting locales, each presenting their own unique challenges and rewards. However, this time around, players can use the other characters more extensively in battles, changing from one to the other. The interplay between Sly and his gang making for a more exciting title with more dynamic action sequences. 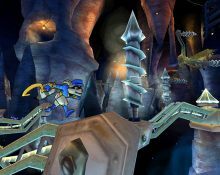 Most of the missions in Sly 3 follow the structure set by the first two, with players having to sneak and penetrate areas while avoiding detection. You'll have to stay on the lookout for guards wandering around, while also escaping the eyes of surveillance cameras and other sensors. Sly 3's structure and approach is familiar and players will find a similar style of puzzles, though there will be a few twists to keep things interesting. As usual, Sly can use his Ninja jump to accurately land on a small object, and pressing the circle button allows him to walk over wires, climb and traverse ledges easily. Sly's small size gives him the ability to climb under objects on the ground and switch to first person perspective to learn the lay of the land. Sly can also use a number of attacks to eliminate foes, with his trusty cane acting as his main weapon throughout. One of the more interesting additions is the Sly's newly enhanced and expanded disguise system, which changes his appearance more dramatically, allowing him to sneak into more areas undetected. To increase the realism of this system, Sly's moves and even his personality will change when he is disguised. This will help him evade the guards, who are going to be much smarter this time around, with increasingly sophisticated AI making their moves less predictable. 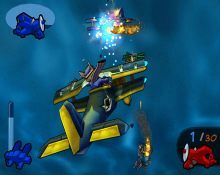 In order to help him locate objectives, players can press down on the right analog stick, which activates a special system that projects a hologram onto his next objective. In order to learn all of these techniques, Sly's pal Bentley has set up a special training area where he can practice moves he's only read about in Thievious Racoonius, the family's stealing tome that's been passed down through the generations. 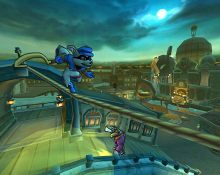 While the majority of the time is spent playing as Sly, the other two characters also have unique abilities that players can use. For example, Bentley's brute strength allows him to plow through enemies quickly, while Bentley's more cerebral approach makes him the best choice for breaking locks or disabling security systems. 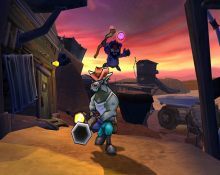 To add even more depth, Sly 3 implements more fighting moves for the main characters, with a deeper combat system that will give all three new moves and attacks. Sly gets more powerful combat attacks, Bentley can now use special gadgets with his wheelchair and Murray gets new brawler moves. Learning and mastering these moves is quite important since the trio faces a variety of new and old foes who are smarter and more dangerous than ever before. While many of these changes might seem minor and subtle on the surface, they make a big impact in practice. Many of the objects that you come across in each level will contain secrets as well. For example, after Sly steals a painting from a gallery he can bring it back to the hideout where his pal Bentley can examine it to decipher its hidden meanings and uncover additional clues. Sly 3's missions will also feature a greater amount of variety, with more mini-games and challenging boss encounters to spice up the usual assortment of stealth levels. 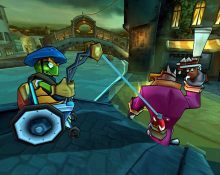 Players will also find a variety of vehicular missions in the game as well, with new flying and driving areas giving Sly 3 a more expansive feel than previous titles. Sly 3's inventory system has also been greatly enhanced, with Thief Net offering more significant types of weapons and gadgets with additional storage space. Another singificant change this time around is the new co-operative missions, which allow two players to compete against each other via the split screen. They'll both be racing towards the same objective, but can use a variety of tricks and gadgets, such as smoke bombs, to impede their opponents' progress. This is a fun addition that extends Sly 3's replay value even further. Finally, vehicular missions have been greatly expanded, with cool new racing and flying levels included in the game that make a nice break from the more traditional missions seen elsewhere in the game. These enhancements work well within the existing context, and add some entirely new play mechanics and tasks to the game, and go a long way in keeping the formula from becoming stale. The gameplay unfolds at a good pace, with a solid progression from simpler areas early on, to more challenging levels later on. Most of the action flows at a good pace, though there are some interesting additions at certain points. In certain areas, players can use the included 3D glasses to add a new dimension to the mission. These aren't required, and you can switch back to normal mode if you want, or not even bother with them at all. However, the glasses allow you to find previously hidden areas and objects. The glasses can also be used in conjunction with Sly's new Time Machine gadget, which allows players to go back to replay these earlier missions with different weapons, gadgets and disguises. While it could have become gimmicky, it's turns out to be a pretty cool idea that adds more variety to the game. Visually this looks impressive with an excellent sense of depth-perception that takes the missions to a new level. Actually being able to see where laser-beams are in Sly's path is pretty cool, which makes dodging them all the more satisfying. From an aesthetic standpoint, the game's cel-shaded graphics look great and the engine allows for smooth animation and movement throughout. The expansive level designs allow plenty of freedom of movement, while the linear structure propels the plot forward. Sly 3's camera system is fairly standard and is easy to use, through the default angles rarely pose much of a problem. Solid voice acting and an appropriately sophisticated soundtrack add to the game's atmosphere. While the overall look hasn't changed much from the last two games, Sly 3's solid production values retain the beautifully designed, cartoonish look of the previous titles while adding new features that enhance the gameplay. While many franchises are content to rest on their laurels after a certain amount of time has passed, and they've achieved some success, Sly Cooper and Co. escape this fate. Instead, the developers have built on the solid foundation, adding some new elements while offering plenty of the stealth-action that made the games so popular. The pacing and flow of the game is excellent, with individual levels offering an array of different tasks, from sneaking and stealing, to infiltration, some out and out race modes and more. Players will definitely get a workout, since the game throws you into a variety of different situations. The additional weapons, added playable characters and disguise system are all welcome changes. Sly 3's multiplayer mode is also a fun diversion, bringing a solid competitive element to the game effectively. It could have ended in disaster, but even the 3D missions manage to feel integral to the main game and add to enjoyment of the overall experience, making Sly 3 another solid title in the series. Sly 3: Honor Among Thieves is a challenging, exciting game that makes some significant additions to the series' conventions while retaining the essential elements that made Sly's earlier adventures so appealing. Sly 3: Honor Among Thieves is an enjoyable, entertaining game that keeps the series' reputation as one of the most consistently entertaining and unique series on the PS2 intact.